I must admit, I’ve never been bar-hopping before. But with the fever for The Last Jedi, which is right around the corner, and Star Wars pop-up bars popping up right in my neighbourhood, the chance was too good to miss. So I donned my Darth Maul gear, painted my face (with the help of my roommate), called upon the Force to serve my will, and set out to the first Star Wars themed pop-up bar on Hollywood Boulevard, L.A. This bar had an entry charge which seemed steep at first - $30 – but I got two free signature cocktails with that, so it seemed reasonable enough. I had a tough time finding it though, because it was new. After hunting for twenty minutes, I finally asked the guys at the Chinese Theater, and they directed me right into the theater and up to the third floor, where the bar was set up. As I walked in, the first thing that struck me was the attention to detail in the décor and feel. Tastefully done up, with black walls contrasting with lightsaber colours, and blasters and Star Wars guns hung on the walls, it made a nerd feel right at home. Everything had LED lights – from the arched entrances, to the tables, to the ice in the cocktails! That’s right – the cocktails had LED ice cubes, and dry ice. That's the first cocktail I had, called “The Red Force,” a cranberry and vodka based cocktail with a fruity yet strong flavour, served in a round glass globe. Its counterpart “The Blue Force” (which I didn’t have, because Dark Side loyalties) was gin based. 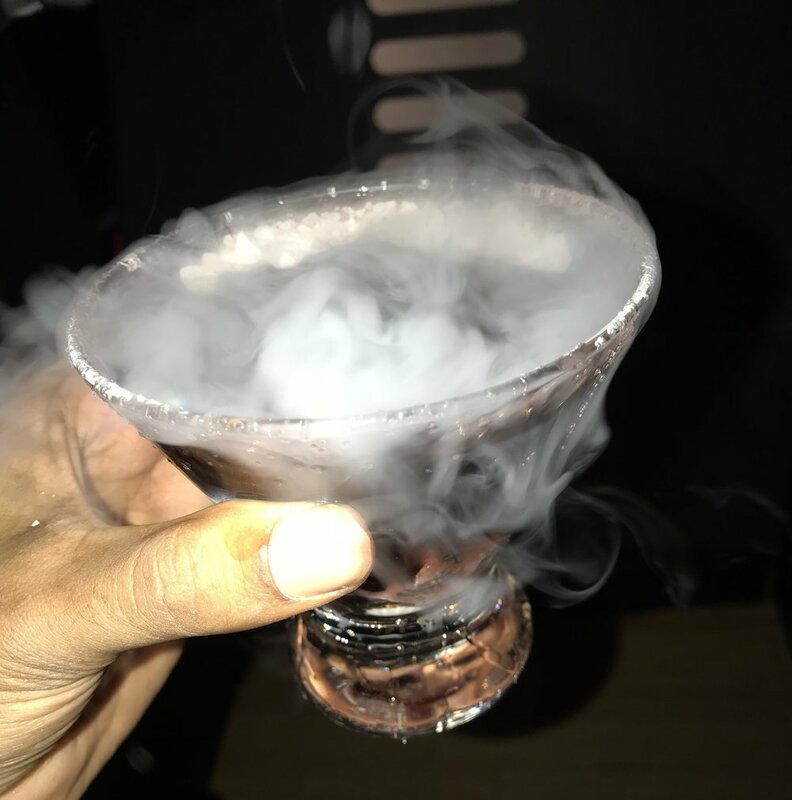 For my second cocktail, I chose a drink called “The Galaxy,” a combination of black vodka, fruit extracts, dry ice and smokes, with sugar crystals on the rim. It was stronger than the previous one, giving me more of a kick. No LED ice in this one, but a lot of smoke and bubbles. Pretty good stuff. I did prefer the taste of this one over the Force drinks, but I still can’t get over the flashiness of that LED ice. There were people happily dressed up, and dancing to some pretty good remixes of John Williams’ soundtrack. I made friends with a Vader, a Kenobi and a Kylo Ren, and took the requisite cosplay pictures. The servers dancing with LED hoola-hoops made it all the better. To top things off, I decided to duel with Obi-Wan Kenobi. Unlike the real Darth Maul, I won. If the previous bar was a generic “dark side” themed bar, this particular one was very very specific. What comes to your mind when you hear “cantina?” Han Solo shooting first. Mos Eisley spaceport. And there you have it – the Scum and Villany Cantina. This bar had free entry. It started out as a pop-up, just like the Dark Side bar, but became so popular for its friendliness towards nerds (and non-nerds) and cosplayers, that it’s stayed right where it is, over the years. While the décor in The Dark Side bar was futuristic and flashy, the Cantina was toned down a bit, to resemble the dark interiors of the Tatooine cantina. It was also more spacious than the Dark Side bar. Near the entrance, there was an LED mockup of the spaceship trackers used to track the Death Star’s movements from the Rebel base. The cantina had sitting spaces styled as booths, which will make you feel right at home if you’re waiting for customers to transport on the Millenium Falcon or your own personal smuggling ship. The cantina’s drinks, true to its name, weren’t flashy, like the Dark Side bar. Served in ordinary glasses, it makes you truly feel like you’re at a nice shady bar. (Though nothing compares to the REAL shady bars of Mumbai obviously!) My first drink of choice was a “Wretched Blue Milk,” their best-loved signature cocktail. Containing rum, blue curaco, Coco Lopez and pineapple juice, it had a nice tropical flavour to it, with a slightly spicy zest, and a slightly thick feel. There wasn’t much in way of dancing in the cantina, so I decided to focus on drinking. After downing the Blue Milk, I had a sip of my friends’ cocktails to judge what they were like. (The cocktails, not my friends.) I tasted an “Outlander,” which is basically a rye-based Old Fashioned cocktail, with an added zest of ginger liquor; and also an “Ambrosia,” a curious banana liquor/vodka cocktail served with a generous topping of whipped cream on the surface of the glass. My favourite was the Blue Milk, but for the whisky-loving crowd I’d recommend the Outlander, hands down. After an absolute nerdy, tasty and satisfying night out, I think I can definitely say that this experience has spoiled me for bar-hoppping, Star Wars themed joints, and cocktails in general. While I would hold on to my pockets to shell out $30 to gain entry to the Dark Side bar, it definitely has flashier drinks and the décor as compared to the cantina. And it’s nice even if you go alone, as I did. You don’t necessarily need a group to go with. The down side is that they don’t serve food, only drinks. However, if you’re looking for a friendlier atmosphere with a group to nerd out with, you should definitely head to the cantina. With its stripped down but tasty drinks, and an atmosphere of scum and villany, it should be more than enough to satisfy all your cravings for good drinks, and Star Wars. Oh and the cantina serves food, which I didn’t review because I wasn’t hungry (or maybe just too high). So the next time you’re in L.A., and looking to have a great Star Wars experience, you should definitely come on down to one – or both – of these places! Captain's Log: Sooraj once visited the Star Wars Disneyland experience, and wasn't a fan. He makes music which you can check out on his Facebook page or YouTube channel.